Join us for a service of Holy Communion in Dutch according to Common Worship, in traditional language. The sermon is normally in English. Join us for our English Holy Communion service with hymns and organ accompaniment. Coffee and refreshments are served after the service in the Church Hall. Choral Communion with orthodox liturgical music sung by the Russian choir Choruss. Join our Communion service with the latest Gospel music, lead by our Gospel Band. 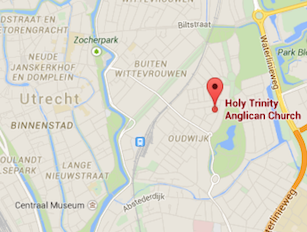 Join us for a service of Holy Communion in Dutch according to Common Worship. A wonderful English traditional service. After the service, there is an opportunity for fellowship in the parsonage, while enjoying refreshments served with cake. Our monthly Prayer and Praise service with our own Gospel band. There is time for fellowship afterwards in the Parsonage Hall. Holy Trinity Utrecht has instituted a new service once a month on the first Saturday of the month, an 8pm Solemn Holy Communion service using a traditional language liturgy and with incense. This new service is like the service we have on the 5th Sundays of the month, although it is without the choir. It will be a more meditative in character, with times for quiet reflection and a talk on the Sunday readings.